Is it just me, or are boxed croutons the biggest rip-off going at the grocery store? I don’t actually know the last time I might have bought croutons in the past, but I certainly don’t see it happening in my future. Or large pieces of hearty bread with seeds, freshly drizzled with olive oil, mixed with herbs and spice, and toasted to crunchy-on-the-outside-a-little-soft-on-the-inside-deliciousness to add by handfuls to your evening (or anytime) salad? Here’s what I do, just varying the breads and herbs to what I have or feel like. 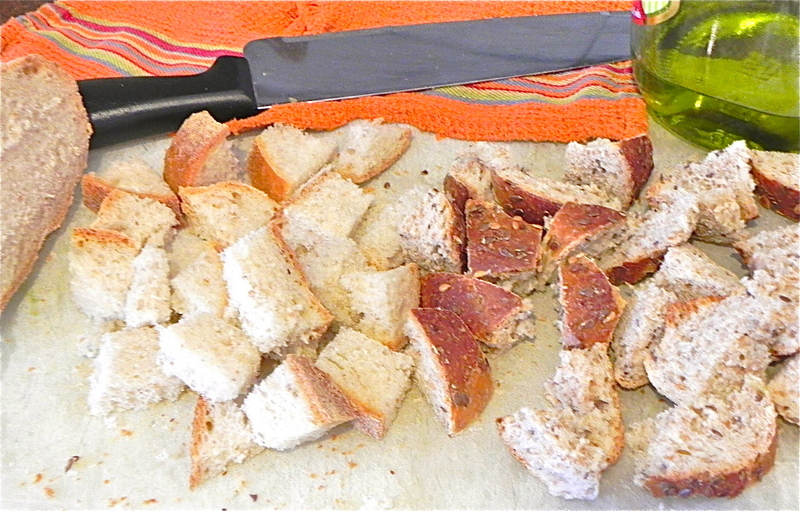 Roughly chop (or tear, for crisp craggy edges) some nice bread – crusty Italian or French, a bagel, country multigrain, etc. 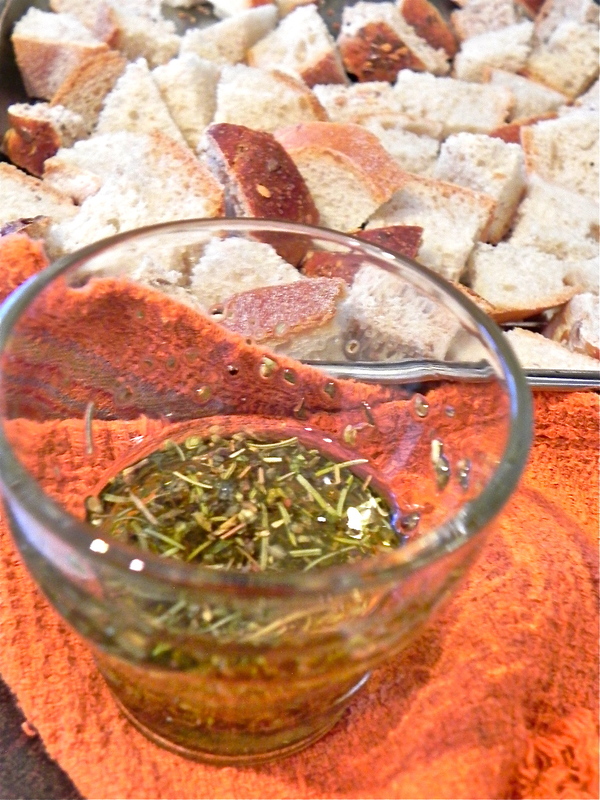 Mix the oil, salt, herbs, and drizzle over the bits of bread. One of the nice things about doing this yourself is that you can make your croutons toasty without being brittle. A little soft on the inside so you can spear them with your fork, while the outside is crusty. 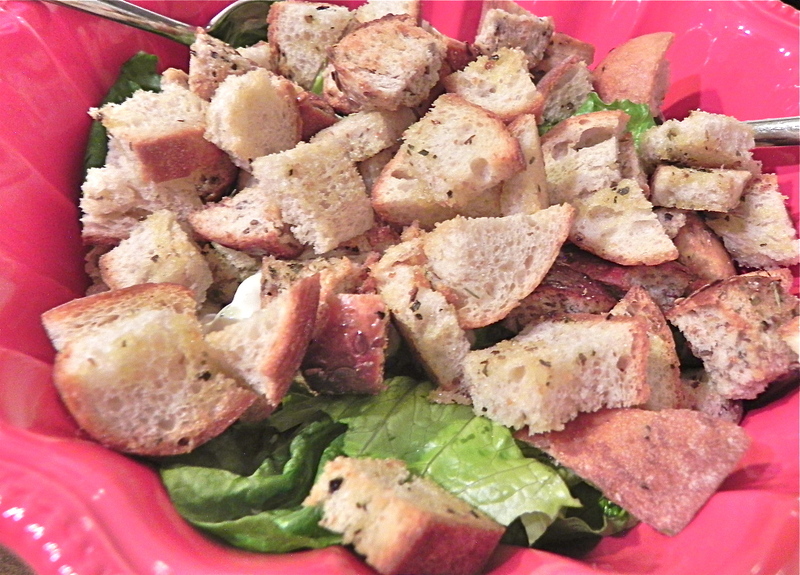 I usually make large croutons – not like the small dice that come with board games – and put a couple or more handfuls onto the salad for lots of crunch. 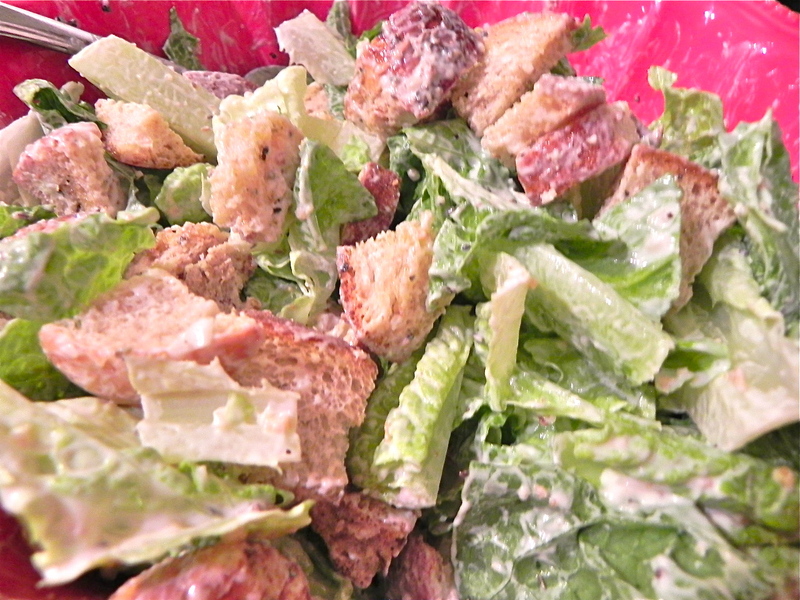 Dress the salad (without croutons) just before serving it, then heap the croutons over the top and give another toss so they are distributed, but not soggy from sitting in dressing. Previous do you do this? The shop bought ones are really hard to describe aren’t they? I think I last bought them when I didn’t know any better, many many moons ago. Exactly. Once you have had nice ones, why would you go back.? Thanks… I’m glad I’m not the only one. It is definitely not just you…..there is no going back!